Campaign signs form candidates for Hidalgo County Justice of the Peace Precinct 4 Place 2 are displayed side by side near a polling place along Closner Boulevard during early voting Thursday, May 17, 2018 in Edinburg. EDINBURG — Justice of the Peace candidates here continued to point fingers at each other Thursday following a heated altercation at the polls Wednesday night. 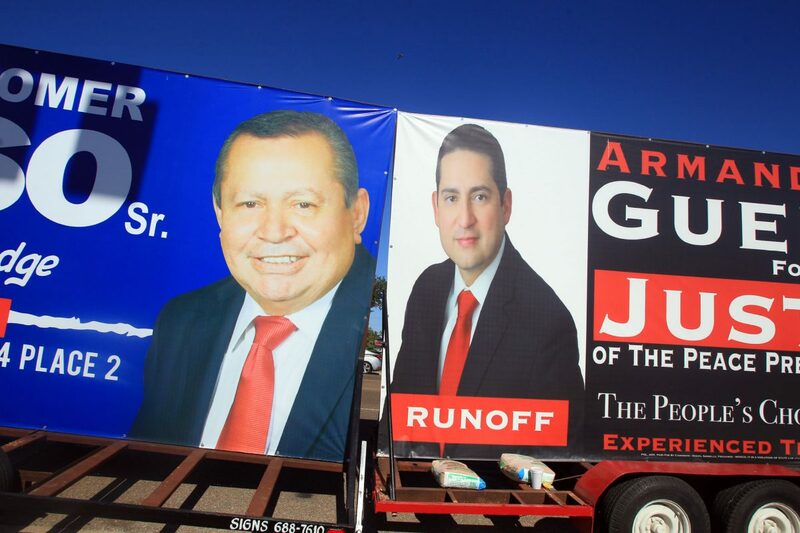 Armando M. Guerra, who is running against incumbent Homer Jasso Sr. for the Precinct 4 Place 2 seat, issued a statement Thursday morning accusing Jasso Sr.’s adult children of instigating an argument outside a polling location in Edinburg. Guerra didn’t mince words in his statement and took the opportunity to draw attention to a public reprimand Jasso Sr. received last month from the Texas Commission on Judicial Conduct for a number of violations to the Texas Code of Judicial Conduct, including hiring and making inappropriate comments to a female employee with whom Jasso Sr. had a previous relationship. Supporters for Hidalgo County Justice of the Peace Precinct 4 Place 2 candidates Homer Jasso and Armando Guerra sit cross the street form each other as they campaign near a polling place along Closner Boulevard during early voting Thursday, May 17, 2018 in Edinburg. 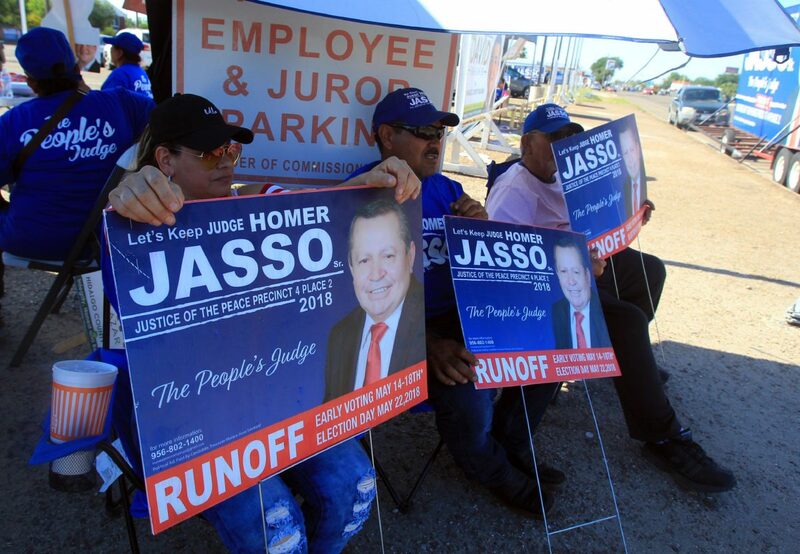 Supporters for candidate for Hidalgo County Justice of the Peace Precinct 4 Place 2 Homer Jasso campaign near a polling place along Closner Boulevard during early voting Thursday, May 17, 2018 in Edinburg. 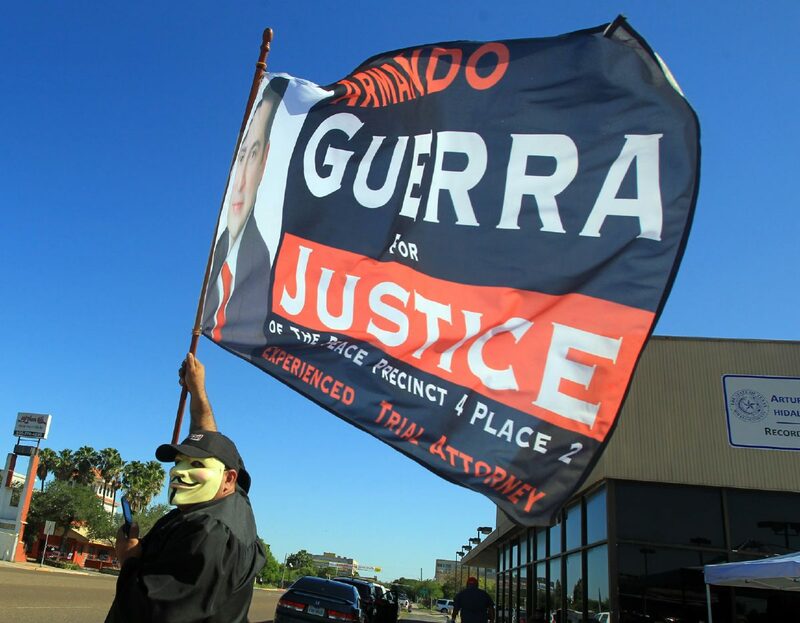 Supporter for candidate for Hidalgo County Justice of the Peace Precinct 4 Place 2 Armando Guerra waves a flag displaying his name near a polling place along Closner Boulevard during early voting Thursday, May 17, 2018 in Edinburg. 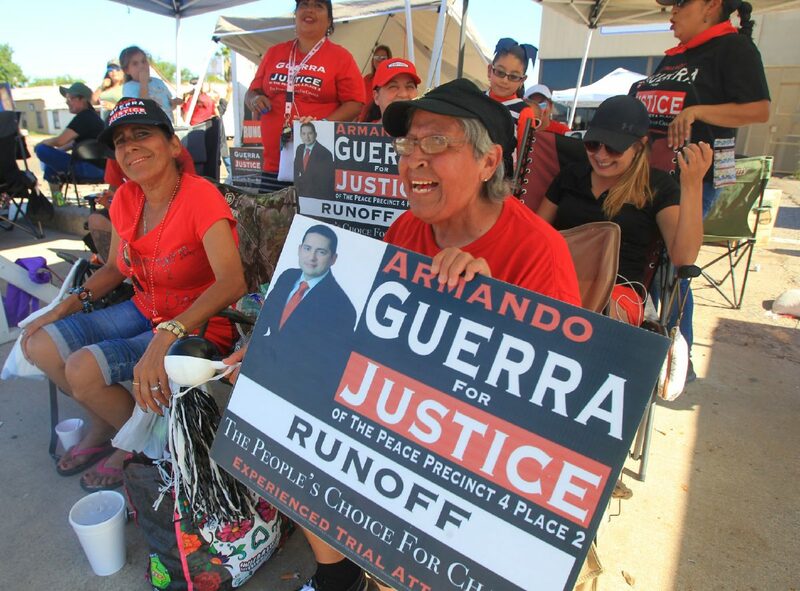 Supporters for candidates for Hidalgo County Justice of the Peace Precinct 4 Place 2 Armando Guerra campaign near a polling place along Closner Boulevard during early voting Thursday, May 17, 2018 in Edinburg. It’s important to note Jasso Sr. was not convicted of a crime, but rather reprimanded and ordered to repeat an 80-hour training course. 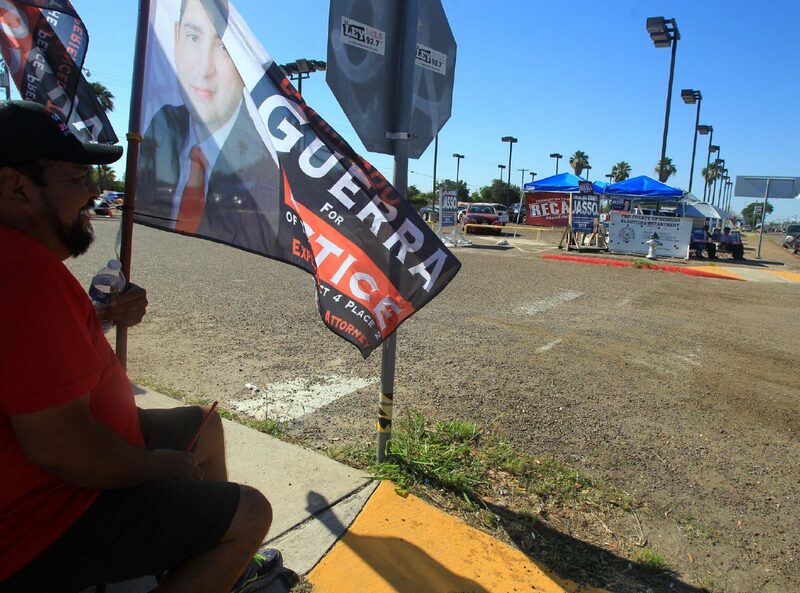 Guerra and his supporters, however, have been using the reprimand as a platform in his campaign, often chanting “no means no” and “Guerra against sexual assault” as voters walk into the Hidalgo County Elections Annex to cast a vote. Tension boiled over as the polls drew to a close Wednesday night with Jasso’s adult children confronting one of Guerra’s most ardent supporters. The siblings, Edinburg Councilman Homer Jasso Jr. and Laura Jasso, were filmed as they tried to confront Miguel Angel Garza while others held them back. Garza said the Edinburg councilman crossed into Guerra’s camp to talk to him. At least three videos have been circulating on social media ever since. “Clearly the videos speak for themselves,” Guerra said. The Edinburg attorney provided copies of the footage to The Monitor and highlighted a portion of a video that shows Jasso Jr. turning his attention to Guerra, who was standing outside of the camera’s view. “(He) turned his aggression to me and said, ‘and you,’ as he rushed toward me, but was restrained by Gabriel Salinas,” Guerra said. Jasso Jr. accused Guerra’s camp and Garza of harassment and disorderly conduct at the polls following the incident Wednesday night. While it’s unclear what the supporter was referring to, the Jasso camp alleged the comment was proof of a coordinated attack. “If I was doing that — there’s police officers here — they would’ve arrested me,” Garza said in response to the accusations of harassment and public disorder. But Jasso believes police didn’t do enough Wednesday to keep the calm. On Thursday, about five officers could be spotted huddling under a tent, keeping a watchful eye on the camps. The atmosphere, however, appeared calm compared to the traditional hoopla that has come to be the norm there. The incumbent was not present during the scuffle, he said. His sister died Monday, leaving him with little time to spend at the polls. The 74-year-old said he was concerned about the negative light the incident cast on his family. The justice of the peace said he’s been trying to get police to review an alleged incident that occurred last week between himself and Garza. Garza made headlines last week after being arrested on suspicion of driving while intoxicated for the fourth time since 1988. Critics argued he received preferential treatment because Edinburg Mayor Pro-Tem David Torres stepped in and had him released before Garza appeared in front of a judge for formal charges. Garza, who is out on bond after being charged with the third-degree felony, pointed at the criminal charges he faced as a result and said he did not get a free pass. Garza instead pointed to an incident that happened about five years ago in which Jasso Jr. stepped in for his sister Laura Jasso, who was facing a possible arrest after an alleged domestic dispute. Monitor records indicate Jasso Jr. arrived at his sister’s home to try to stop Edinburg police from arresting the former Hidalgo County court bailiff. Laura Jasso was not arrested and her partner refused to file charges against her. Police at the time said the councilman’s involvement was not a factor in the decision. Police continue to investigate the scuffle and could be seen trying to take statements from witnesses at the polling site Thursday. Early voting will continue through Friday, with Election Day set for Tuesday. This story has been updated to reflect the correct runoff date.